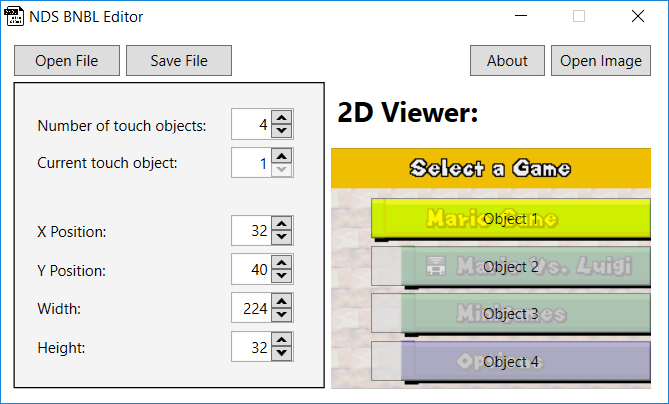 So I decided to code a GUI editor with a 2D Viewer with the help from RoadrunnerWMC which in his ndspy library explained me how the alignment worked. A preview would be nice, so we know what the tool looks like before a download. COOL! I can edit the file positions now! Only the places where you can touch are changed, not the graphics. Will try to make a BNCL if I get the time so you can also edit the graphics . Where did you even find a zip download? You need to download "NDS_BNBL_Editor.exe" instead of "Source code (zip)". Please note this version link is outdated now.